Being counted amongst the leading companies we are to offering a quality tested array of CNC Coil Winding Machine . These are manufactured using superior quality material which we brought form the authentic vendors of the market. Moreover, these require less maintenance and are delivered in a fixed time frame. S. N. Mechanical Works has been engaged in the manufacture and supply of a wide spectrum of outstanding quality Winding Machines. Our products include CRG Core Winding Machine, Linear Transformer Winding Machine and C.T.Winding Machine. At the start, we catered to the requirements of the domestic clients and have now extended to international markets as well. We value the suggestions of the client and are committed towards delivering the products as per the specifications detailed by them. We have a customer centric approach and are always open for any help required by our clients at any point of time. 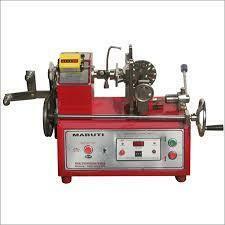 We have a policy of rigid quality testing and the machines are tested at each point of the manufacturing process. We ensure customer satisfaction with timely delivery of the goods along with a continual development program. We ensure finest quality of the products by a strict quality inspection procedure conducted by professional technicians. We offer our customers with quality products at cost effective prices. We have to a great extent achieved the most difficult aspect of gaining the trust of the customers. We have evolved a continuous process of achieving and maintaining highest standard of quality, keeping in mind the needs of the customers. We continuously make sincere efforts and strive to earn maximum client satisfaction by providing our customers with unmatched quality products and ensuring timely delivery of the same all under pocket friendly prices. We have a team of well qualified, dedicated and experienced personnel to help us in the design and manufacture of our products. We continuously take tremendous efforts to establish a friendly and trustworthy relation with our clients.